We had session this morning from 9:00 a.m. to 12:00 noon. I missed church to go directly to Quezon City Hall. Instead of a speech in opposition, I briefly said that the Constitution, as it was being presented, could stand some improvement so that it may compare favorably with other modern Constitutions in the world. But for the moment, the sense of my opposition was embodied in my amendments by substitution to the whole articles on the Declaration of Principles and on the National Economy. It was for this reason, I said, that I was asking that my amendments be inserted into the records. The substitute Declaration of Principles was the one previously worked out and approved by the committee headed by Raul Roco. The members of the committee are really about the most progressive in the Convention. I, myself, have given more time to this committee than possibly, to any other one, including my Economic Committee. I submitted the consolidated draft on the National Economy worked out by the chairman, vice-chairman and sponsors of the 13 economic committees, tinder my chairmanship—on behalf of the Sponsorship Council. I had later on integrated the provisions myself, pursuant to the request of the members of my sub-council. Afterwards, there was a speech by Manong Raquiza. The gist of his speech is that we should not copy many provisions in the Bill of Rights of the United States Federal Constitution; the U.S. is the most crime-ridden country in the world (sic). Raquiza is full of praise for martial law. The whole problem is that most of the delegates, knowing him, are not certain about his sincerity. He is a nice guy, all right, but the problem is that the delegates do not take him seriously because he does not seem to speak with conviction. He is the quintessential politician. I had a brief chat with Sed Ordoñez and Gary Teves. Sed stated that in his interpellation yesterday of Roding Ortiz, precisely he was talking about the effectivity of the Bill of Rights. Is the Bill of Rights suspended during the period of martial law? My major problem about this new Constitution, I told Sed, is that many of the provisions might conceivably be acceptable during this state of emergency, but a few years from now, when normal times shall have been restored, how could we continue with so many provisions in this Constitution tailor-made for a state of emergency? I decided, therefore, to interpellate the rebuttal speakers. I raised three questions. One has to do with the powers of the prime minister and the emasculation of the powers of the National Assembly which might be acceptable during times of emergency but not during normal times. The second thing has to do with the Bill of Rights, with such concepts as general welfare, national security, etc. I would say that in the balancing of national security with individual freedom, the latter should weigh more heavily during normal times even if during periods of emergency, national security might very well be our obsession. My third question dealt on the national economy. There is really no indication as to the goals that we might want to achieve. We have no grand design of development for the country, no real philosophy undergirding the provisions we are discussing. The delegates writing this Constitution do not really have a clear idea as to what kind of economic reforms should be incorporated therein. But what did I get for this interpellation? Cold shoulders from the railroading majority! Gary thought that either one of us who might be able to speak again could ask the question of whether or not the transitory provision is supposed to provide an orderly transition of government. If so, if and when we shall have reached that point where the transitory provision would no longer obtain, whether we can expect the parliamentary government to be restored. When Atoy Barbero came by to see what I was doing, I told him that the concentration of powers in the prime minister might be better placed under the transitory provision. Atoy was frank. He answered that actually that was the original intention but that, in the meantime, the President had personally transferred this provision to the Article on the National Assembly. I asked Atoy why the President thought that even after his regime the Philippines would need a strong prime minister, and why we have weakened the National Assembly so much during normal times. Why may the Assembly press only bills of local application? And why do we not provide for immunity from arrest of members of the National Assembly during normal times? And don’t we believe anymore in checks and balances in the government? “I cannot answer you,” was his laconic reply. Sed Ordoñez said that he had seen our friends at the stockades last week. It was the second time he has visited them. I asked him what the general condition of our friends is and he said there was a general feeling of despair. 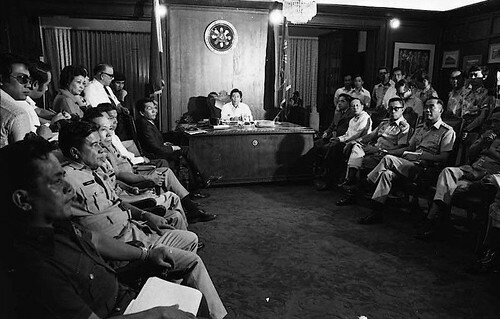 The detainees at Fort Bonifacio have formed some kind of an association and have elected Ninoy Aquino their detention mayor. There are some ten people at Fort Bonifacio. It is not true, Sed continued, that Ninoy is in Corregidor. Sed saw the son of Soc Rodrigo, who is the roommate of Ninoy Aquino. He said that Ninoy was formerly in charge of the kitchen, but the detainees have deposed him and made him the detention mayor of their group. This is the way these unfortunate leaders have been spending their time. I had requested Bobbit’s secretary, Beth Mateo, to help me send some food to the delegates in the stockades. Bobbit said that I could send some things through the secretary of Tito Guingona at Nation Savings Bank or through the secretary of Bren Guiao. I know Bobbit has sent balut to them. Beth Mateo had told me so at the UP yesterday. I should like to be able to send those guys some things, especially considering the fact that both Bobbit and I are not in a position to visit them. We are in the list of delegates for “picking up” in the second round. I mentioned to Sed and Bobbit that I had heard that Manong Raquiza had a hand in the preparation of the first list of delegates who should be detained. That was what I had gathered from—was it Joe Feria? I told them that I meant to ask Manong Raquiza whether or not this was true. “But ‘they’ would soon be drafting a longer list,” Bobbit said mournfully. Ikeng Corpuz was actually sponsoring the Constitution when I entered. Ikeng was talking about his having worked for several days on the Constitution. Ikeng came up to me later with the complaint that I have abandoned them during the discussion of the economic provisions. I replied that this is a useless exercise. Noli Santos later on commented that the problem with Mang Ikeng is that he tries to make you feel he is on your side when actually he is simply a consummate politician, without any definite stand on issues. I felt that nothing would happen today. The only thing to do now is to present some amendments. There is really no use debating with the majority because we cannot possibly win. Bebet Duavit presented a resolution fixing the date of the plebiscite. This was, of course, quite irregular. It indicates that the whole thing has been preplanned—”scripted”—as some people would say. Iniong Santillan stood up to question the anomaly. How can we talk about fixing the date of the plebiscite when at this stage, we don’t even know whether the Constitution might be approved? There is no harm, Duavit replied. But everyone felt that the reality is that according to the scenario, the Constitution will be approved as is and that the plebiscite would be held at a given date. Judging by the overwhelming approval of the resolution by the delegates, it would seem now that most of the delegates are looking forward to the passage of the Constitution as well as their assumption of office as assemblymen of the Republic. If there were a good number of delegates before who were not in favor of the draft Constitution, there are less of them now. And part of this comes from what I think is the “come-on” to the delegates, namely, the attraction of being members of the Assembly. It was an immoral thing to some of us before, but now that it has sunk into the minds of some delegates that they are going to be assemblymen, I think that many of those who had hitherto been wavering have now resolved their doubts in favor of being assemblymen—so we should hang up and finish the Constitution. Our dwindling group went to the house of Pepe Calderon at noontime to assess the situation. There, Cecing Calderon (Pepe’s brother) told us that according to Toto de la Cruz, we should be around on Monday because Monday will be the second reading on the Constitution. This is the most crucial voting, the decisive one. The third reading will only be a formality. Cecing was warned by Toto not to be absent because it seems that one of the conditions that would be imposed was that to be a member of the Assembly one must vote on second and third reading—in addition to the requirement already imposed that only those voting affirmatively for the transitory provision would qualify. The initial plan was for Pepe Calderon to be absent while his brother Cecing would be present and would abstain. Totoy Nepomuceno was thinking of abstaining. Bobbit and I were thinking of voting “No.” Naning Kalaw was thinking of abstaining. Joe Feria did not tell us what his thoughts were. Cecing thought that considering the fact that most of us have already voted “Yes” on the transitory provision, it would be natural for us to vote “Yes” now, too. However, Bobbit Sanchez argued that to vote “Yes” is practically to recommend the Constitution and it is really very difficult to recommend it because there are problems particularly on the provisions concentrating the executive powers on the prime minister. I gave Joe Feria a lift when we returned to Manila. He broached the idea of a smaller group of us meeting next Saturday morning for a prayer meeting. I approved of it. Perhaps we have not really been a prayerful group of delegates in spite of our daily rituals of invocations. We should really make a sincere effort to ask for God’s guidance on this very crucial issue. I thought that we should really be certain that we have the courage to do what God expects us to do at the moment. Is God coming down to save us?